Click here to see a list of our current featured products. Click here to view our current and past newsletters. Welcome to Heartland Medical Equipment. Heartland Medical Equipment offers affordable quality solutions for all of your Home Medical Equipment needs. With a full range of medical equipment and supplies, Heartland Medical Equipment will provide you with both superior products and a knowledgeable staff. Rediscover the confidence that comes with independence – venture to work, play, school, or wherever your imagination takes you. With the right products, nothing will slow you down! At Heartland Medical Equipment, we understand that living with certain medical conditions and disorders or recovering from injuries and surgeries can be difficult to cope with, and that shopping for specialty products can be frustrating. It is this understanding that leaves us confident that our trained and experienced consultants will help you find the right solution for managing your condition and regaining your independence. When you’re recovering from surgery or learning to live with a chronic condition, it’s important to keep your energy focused on your health. You shouldn’t have to worry about your medical supplies or whether you have the right equipment to help ease your transition home. At Heartland Medical Equipment, we’ll do all of that for you and more. We provide you with the latest and best in Home Medical Equipment to make your life more enjoyable. We have been providing quality care and products for over 22 years in a comfortable and professional setting and offer educational information designed to help you come to a better understanding of your condition and its methods of treatment. 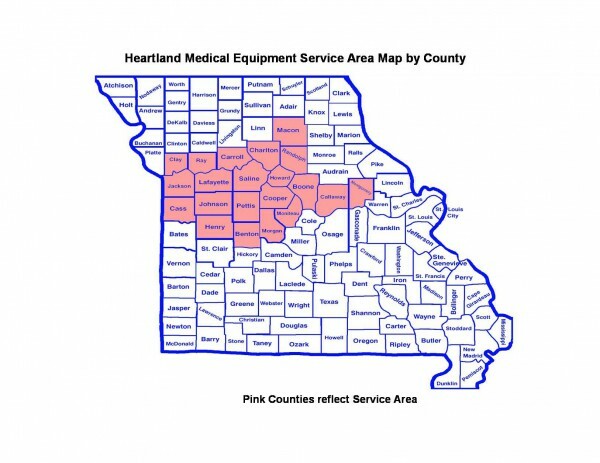 Customers from Marshall, Sedalia, Warrensburg, Sweet Springs, Brunswick and surrounding communities have come to trust our personal service and affordable Home Medical Equipment. Serving the needs of Mid-Missouri is our focus, so if you or family members are in need of Home Medical Equipment, we are only a phone call away. Call us at 800-332-1463 or send us an email at info@heartlandmedequip.com with any questions. We look forward in assisting you with all your Home Medical Equipment needs.